For this week's Yarn Along, I'm back to working on Elizabeth's cape. I hope I can concentrate on it a little more after my break to knit Finn's chain maille and his socks. I just started reading Chew On This to the older kids after Elizabeth read parts of it in school and wanted to read the rest and let her brothers read it too. We haven't gotten too far into it yet, but I really appreciate how the book begins at the beginning and gives the history of fast food, how it started, why it became popular and how it grew to become such a large industry. I finished Finn's socks over the weekend so I wanted to share those too. He's always so excited to get a new pair of socks, or anything knitted really. I used the Easy Toddler Socks pattern again and put notes on ravelry for enlarging them a bit. The yarn is Risata, from KnitPicks, which a cotton-merino blend that is a perfect weight for chilly spring/fall evenings and mornings. Risata, unfortunately, isn't carried by KnitPicks anymore. I actually bought it for $2/skein on clearance and the socks took almost exactly one skein so I have another to make a second pair of socks later. The color is Clementine which is so very Finn in all of it's orangy glory. I just love Finn's socks! That book looks really good too. Love the socks! 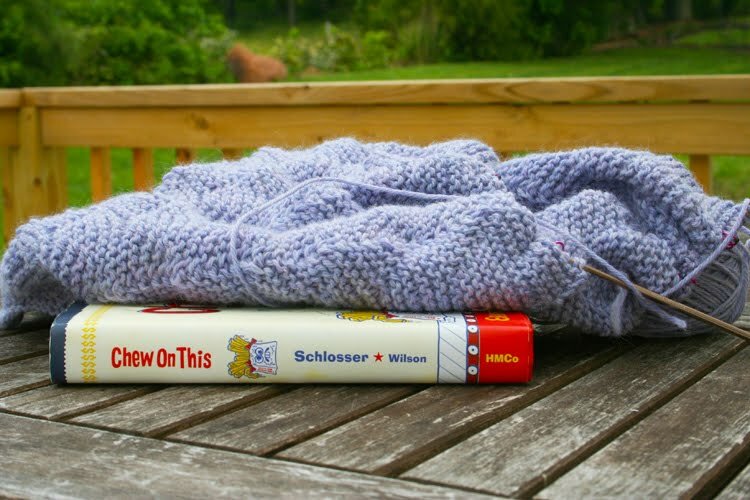 Hope to get there in my knitting someday. Love the day glow orange! Looks awesome! Your sock model is precious and the color of the socks is amazing! Love it! 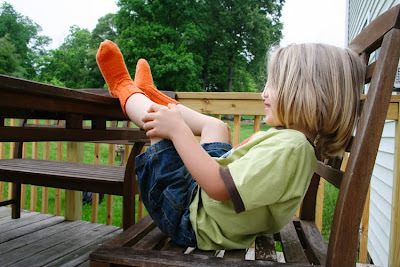 Oh, how I love orange socks!! Finn looks darling in his socks. And your work looks so perfect. I picked up knitting years ago but just never moved far beyond easy stuff. Ever since you have picked it up I've been in awe of the items you have made. I want to try knitting my first pair of socks this year, but am super nervous about it. But I guess I won't get over the fear until I jump in and do it. Love the color you picked out. So bright and vibrant. And you have me wanting to go check and see if that book is in my local library. It really has me curious. I'm on a new kick of bettering my eating habits with the gluten-free issue, which is a challenge in itself, and try to get my family to pull away from fast food. My mom is quick to jump ship if she hears or reads actual statistics, so I may have to give this book a try.